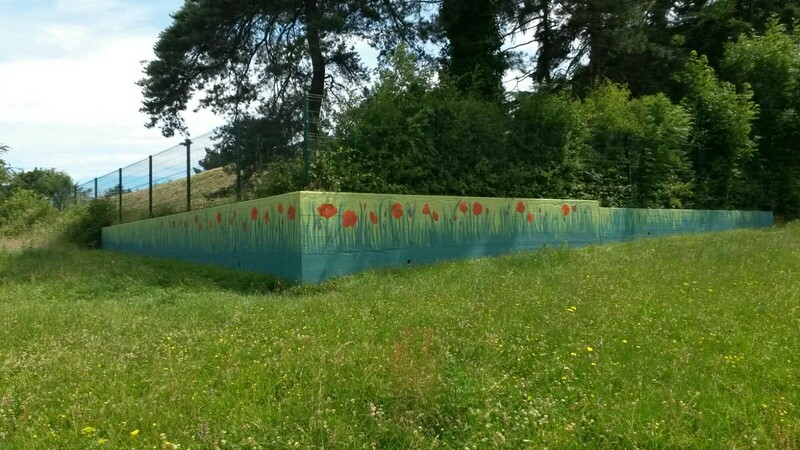 Bramcote Conservation Society have recently painted a mural of poppies on the wall of the reservoir on Glebe Field adjacent to King George V Park in Bramcote. Conservation member Christine Dilks designed the mural and painted the poppies, with assistance from several other members in preparing the base coat . The work has been carried out with full permission and support of Severn Trent Water (owners of the wall) and will be an uplifting reminder for years to come of those from the village who died in World War 1 . Editor’s comment: The three photos show the progress from an eyesore to something pleasing to the eye. Thank you to those involved. Absolutely fantastic! A fitting tribute to the memory of all those who lost their lives in the numerous conflicts these last 100 years. Credit to our Conservation Society for all their efforts and hard work. Hope lots of us will come along on Sunday afternoon, 2.30pm, for the special commemoration and drama ‘Beyond the Bluebells’ written by Pat Ashworth. A huge improvement on the usual graffiti. Thank You ! Well done to you all . A very imaginative and low-cost solution . Looks great. Hope to see it in the flesh soon.